Olgii, which is the capital city of Bayan-Olgii aimag, is the best logistics point to embark on a tour of Western Mongolia. 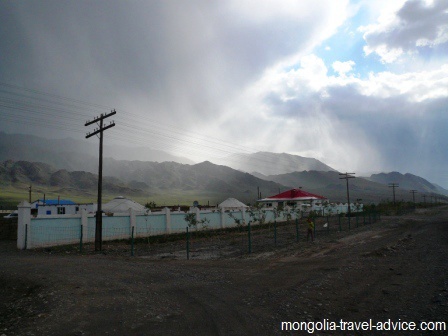 As far as Mongolian towns go, Ulgii (as it's also spelled) is quite pleasant and welcoming. There isn't a great deal to do outside the local nadaam festival, but it's the logical place to stock up on supplies, find a Kazakh guide and/or driver, and head out into Bayan-Olgii's spectacular countryside. This is a sub-page of my Western Mongolia page. Olgii, a pleasant place to spend a couple of days organizing your trip to the countryside. Picture of the main street. Everywhere you look in the city, you will see rugged mountains rising up in the distance. This, and the remoteness of the city from Ulan Bator (over 1,000 miles away) gives the place a pleasing 'frontier' feeling. Such a sense is aided by the fact that the rapid growth seen in mining towns such as Dalanzagdad has largely bypassed Olgii, and the town seems at least 20 years behind Ulan Bator. Add to this the clothes, customs, and low, mud-brick houses of the Kazakh population, and you may feel like you've left Mongolia and flown into Kyrgyzstan. 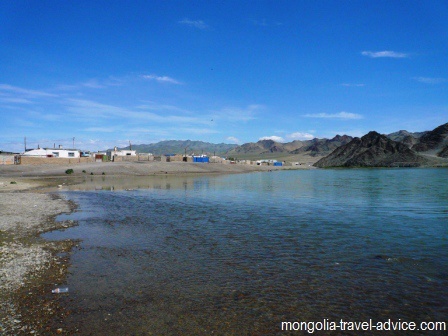 Ulgii lies on the banks of the Khovd river and is the natural jump off point for trips into Tavan Bogd National Park. Nestled between the Altai mountains and the Khovd River, Olgii has one of the prettiest settings of any Mongolian city. Ulgii's very easy to get around. The main area of town is only a few blocks, the rest is surrounded by residential ger districts. 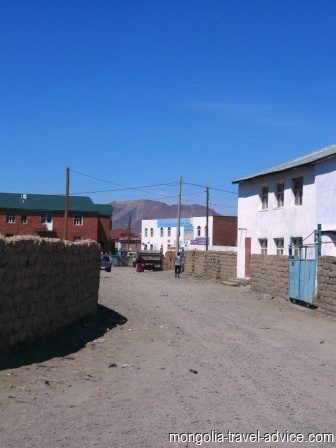 Click on the below google map for a guide to Olgii; on it I've added locations of the best hotels and restaurants in Ulgii, some things to do such as visit the local black market, and locations of ticket and permit offices. There are a few options for accommodation in Olgii, though don't expect to be blown away by the standards or value for money. The new Tsambagarav hotel is defintely the best of the Bayan Olgii hotels, with very clean rooms and even wireless internet (a rarity in this part of the world). However, in 2011 the rooms started at about $80US and, after an inspection, my fiancee and I decided they were pretty poor value for money and ended up staying elsewhere. We did have a couple of meals in the 2nd floor restaurant, however, which were decent enough. You can't miss this 3-storey, bright green building just north of the town square. Next door to the Tsambagarav hotel lies a ger camp which is definitely the most budget option in town. It is set back about 50m from the road, through a beautiful garden. The place always seems to be paying loud music, though, and probably hosts its fair share of drunk Mongolians, so it's definitely for the very budget conscious only. As with all ger camps, try to use your own padlock. All travelers should note that the summer garden is a fantastic place for beer after roughing it out in the countryside. The Bastau Hotel is the choice for most budget or mid-range travelers. The rooms are acceptably clean, and have hot water showers for a couple of hours each morning and evening. Many rooms have ensuites. The owners are quite friendly in their own way, and run a quiet little restaurant downstairs where you can buy basic food and drinks. The hotel has a lockable area out the back where overlanders can store their vehicles/ motorbikes. The Duman Hotel is listed in the Lonely Planet selection of good hotels in Olgii but is a little removed from the action and seems to have quite a loud night club downstairs; due to these reasons I chose the Bastau whenever I went back to Ulgii and didn't take a good look at the Duman. 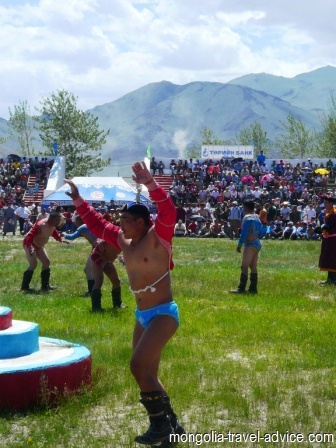 Ulgii is a good place to see a Nadaam festival (Nadaam in here is in late July). The contestant standards may not be as high as Ulan Bator, but it is much less touristed and you'll be far closer to the action. There are a number of options for eating here, most of them serve traditional local fare that you would get anywhere else in Mongolia. The restaurant in Ulgii's Tsambagarav hotel serves good enough food. The place can get a bit quiet, though, and as with the rooms the value for money isn't great. Probably a good choice for breakfast, though, as you can get some decent toast, juice, and coffee. The Pumakkale Turkish Olgii restaurant down the road is a favorite among visitors, with good value meals and a lively atmosphere. There are a few local restaurants in Olgii serving standard (i.e. mutton) meals. I got a bit tired of mutton out in the countryside of Bayan-Olgii, so ended up visiting the supermarkets and preparing basic meals for myself. If you've been in the countryside and gone without fruit and vegetables for weeks on end, this can be quite an attractive option! The black market (see map) offers basic housewares (knives, dishes, cheap camping stoves, etc) and vegetables. The supermarket down the road from the Bastau hotel is the best place to stock up on vegetables, food, stove gas, etc. before heading out into the countryside. There are a number of other supermarkets on the main north/south road, most of them stock similar items (no shortage of candy, bread, or vodka). The Khovd river as it passes through Ulgii. See my Tavan Bogd page for some ideas on rafting trips. 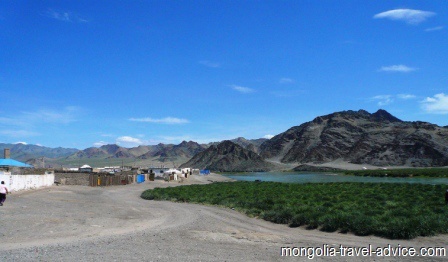 Ulgii is the best place to organize a driver, tour, or bus/plane tickets in Western Mongolia (believe me, you will have far more luck here than in Khovd, Uvs, or Uliastai). There's a Protected Areas Office just off the town square (see my map). They are quite helpful but have interests in a local Bayan-Olgii tour operator, so don't expect competitive prices or independent referrals. The Kazakh tour office is also at the South end of the main square. Don't rely on either of these places being open during Nadaam time (late July). 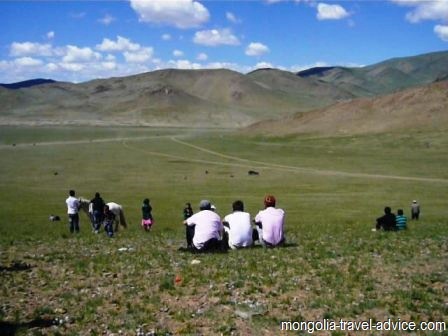 Content created and owned by mongolia-travel-advice.com no reproduction without permission. Back to Bek travel is one of the best Kazakh travel agencies in Western Mongolia. The owner, Aynabek, has excellent English and promptly responds to emails. See my Western Mongolia tours page for information and contact details. Visitor permits for spectacular Tavan Bogd National Park can be purchased from the military base (see map). It might be a bit of a struggle to communicate with the military staff; consider getting a tour agent to assist you. 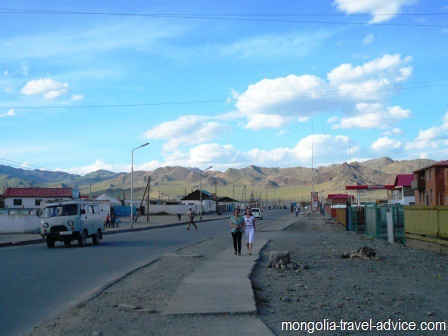 There is a bus from Olgii to Ulaanbaatar which leaves every 2nd day. The ticket office is in a building set back from the road behind a dusty square (marked on my map, above). As with many bus ticketing offices in Mongolia, the non-descript door within the non-descript corridor within the non-descript building is difficult to find without a guide, so if you have a guide or any English speaking contacts it's definitely worth enlisting them to help you locate the office. Otherwise, just keeping asking people. The bus is reasonably comfortable and you will actually get a seat all to yourself, but after 2.5 days of constant driving and rest stops at average guanz (roadside restaurants) you will be pretty over it. The bus is about 25% of the cost of a flight, though, so it's a pretty sound option for the budget-conscious. Note the bus fills up about five days ahead in summer, so try to secure a ticket well in advance of your intended departure date. Watching the horses race in at the Ulgii Nadaam. There are a number of smaller countryside Nadaam outside the city during late July/ early August. Public jeeps leave near the black market (see my map) and head to Khovd, Uvs, Ulaanhus, Tsengel, and the Russian Border. (Note that public transport to Tavan Bogd National Park that goes any closer than Tsengel will be very difficult to find. I would recommend organizing a private driver. Those bent on doing it on the cheap should take a ride to Tsengel, then wait there on the road to Tavan Bogd and hitch a ride -you could well be waiting all day for one). It helps to have the name of your destination written in cyrillic so you can match it with the labels stuck in the windows of the waiting jeeps/vans. You will save money taking the jeeps compared to hiring a private driver, but you will be crammed in with a large number of people and you may have to wait all day (or a couple of days) for the ride to leave. The public jeeps do have an uncanny ability to leave just on sundown, which ensures you won't get to see the countryside or get any sleep on the uncomfortable overnight journey. Ensure you have warm clothes at hand (i.e. don't leave them in your backpack just beacuse it's hot and sunny when you arrive at the jeep stand). Be patient and prepared for some miscomfort; expect to have a local child seated on your lap. Back from my Olgii page to my West Mongolia page.